Bidets are making a comeback. However, most clients are not opting to spend thousands of dollars to create a separate bidet fixture. Bidet seats or all-in-one toilet bidet combo units are the new normal. This is a relatively new option for us in the United States. These bathroom fixtures have been in style and demand in places like Japan and Venezuela forever. Environmentalists have also helped lead the movement, and the numbers from Treehugger.com illustrate why—each year, 36.5 billion rolls of toilet paper are made; an amount equal to 15 million trees. By using a bidet, you’re helping to reduce the amount of paper waste. What Is a Bidet/ Bidet Seat? A bidet is a plumbing fixture, which looks like a cross between a toilet and a sink, providing a wash solution as an alternative to toilet paper. Used since the 1700s, it has traditionally been a separate fixture from a toilet bowl. However, modern electronic bidet seats can now be fit to an existing or new toilet or are also available in combination models that include a fully working toilet. 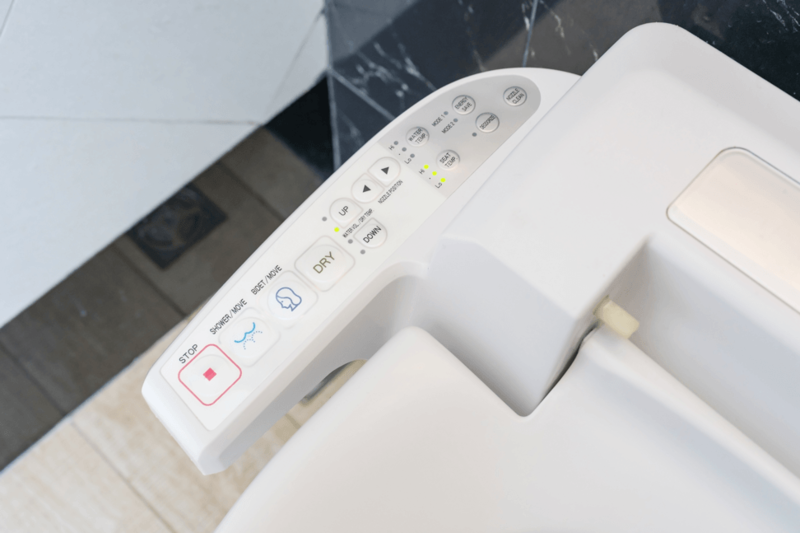 Most of the quality bidet seats, along with the most critical function of the water jets, include features such as flow control, temperature control, heated seat, and automatic drying. This allows you to wash and dry without the use of toilet paper and all the issues that come with that. Some of our clients are even removing existing bidets to create a place for more storage and combining the bidet and toilet, making the space more functional overall. Toto, a Japanese company, is best known for bidets installed in homes. It invented the Washlet in 1980, and launched a system with heated seats, remote controls, and basic bidet functions in 2009. These bidets are convenient in that they are single seats that attach to existing toilets. Over 81% of Japanese households have one; that’s quite a market reach! Kohler and other manufacturers have also followed suit and created their own bidet products. There are several reasons to consider a bidet seat. One is that it provides a cleaner and more hygienic experience from a spray that is used to clean the user and the bowl. Another is that unlike a toilet, a bidet seat prevents waste build-up and clogging from toilet tissue. Plus, with a heated seat and water, you can enjoy a greater level of comfort. One Week Bath can help you with every aspect of remodeling your bathroom. Our selection process assists you in the deciding on the best products for your bathroom. Every element is discussed and considered including fixtures, cabinets, countertops, paint colors, and even the best bidet system for your needs. Whether you’re planning a partial or complete remodel, our experienced designers can assist you every step of the way. There are more than 100 decisions to make in determining the style and functionality of a remodeled bathroom; we will make sure nothing is overlooked. A fantastic design process, all permits and product included in an all-inclusive package, and the peace of mind knowing that your dedicated certified and trained team will install your dream bath faster than any other contractor, insures that you have the best possible experience. Know who is in your home. Rely on a guaranteed price. Minimize disruption to your home and life. For more information on our company and services, request a quote online or call us at 888-374-0622 today!